In our Picks to Click, we feature six players or units from across the state that we feel will have breakout performances on Friday night. This season we’ve assembled a team of six media members across the state to each select one player (or unit) each week. We will track the cumulative statistics of our selections throughout the season similar to fantasy scoring. Check back next Thursday to see our picks for week three, and how the players performed that we picked the week prior. See the bottom of this article for details. Expectations are always high at Hutchinson, but the Salthawks entered the 2013 season with just four returning starters on offense. That lack of experience didn’t necessarily show in a 42-31 victory over Salina Central last week. Led by their only returning starter up front, Cole Cruz (6-0, 278), the Hutch offensive line paved the way for 570 yards rushing on 70 carries. The Salthawks should have another big night on the ground this week against a Haysville Campus team that Hutchinson ran for 450 yards against last season. A quarterback named Kruger is having success as at Silver Lake. Who would have guessed? Dailin Kruger follows a long line of family members who have taken snaps for C.J. Hamilton's Eagles. He already has passed for more than 3,300 yards in his career. Last week, Kruger completed 7 of 9 passes for 158 yards and two touchdowns, while rushing for 67 yards and a touchdown in a win over Wabaunsee. Expect Kruger to have another big game at home against Neodesha. Newton (5-11, 150), the two-time defending 4A champion in the 100 meter dash, is one of the top overall three sport athletes in Kansas. This is a guy who has the ability to take it to the house any time he touches the pigskin. He had a huge opening week game with 188 all-purpose yards, including five catches for 138 yards and a TD on offense. On defense he also picked up an interception, which he returned for 15 yards. Coffeyville shouldn't have trouble against the struggling Parsons Viking's on Friday and expect Newton's numbers to be just as good as last week. Only problem, he may only play one half in this match-up. Southern Cloud is fielding their best team in several seasons thanks to the return of five senior starters, especially quarterback/defensive back Ryan Perkins. After passing for 632 yards and rushing for 382 more and accounting for 20 total touchdowns in 2012, Perkins (5-10, 160) has picked up right where he left off with 203 passing yards, completing 14 of 20 attempts with four touchdowns in last week's season opening win over Frankfort. Perkins is also a force on defense, accounting for 160 tackles and four interceptions in 2012 earning him Kpreps all-state honors. In Friday night's win over Frankfort he tallied 20 total stops and a passed defensed. A very good St. John's Beloit team may be too much for the Warriors this week, but Perkins will continue his assault on the tackles chart and could help keep the game closer than the experts think. Randall had more than 1,000 yards last year and is one of the better backs in the Kansas City Metro. After being bottled up by a dominant Shawnee Mission East defense in the first game look for Randall to break out against Shawnee Mission North. Leavenworth returns a lot of its offensive line and it should be able to move the ball better this week than last. Ubelaker helped Osborne deliver another huge offensive performance in a 64-38 road victory against WaKeeney-Trego Community. Osborne went up 42-14 at halftime and led 58-20 at the end of three quarters. Ubelaker rushed for 104 yards and two scores, collected five punt returns for 226 yards and two TDs and returned a kickoff 78 yards for another score. Overall, Ubelaker accounted for 340 total yards. Ubelaker finished with 2,140 all-purpose yards for a 6-3 Bulldog team in 2012. 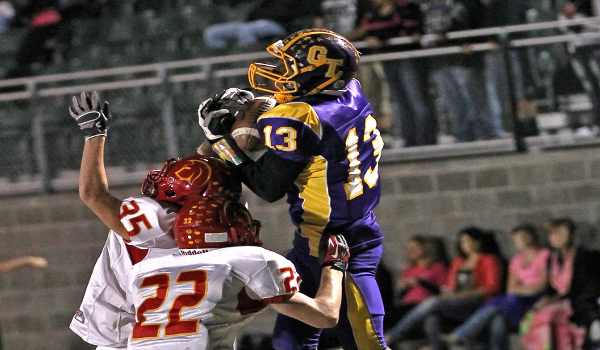 Osborne faces Hill City on Friday.